Back pain effects eight out of ten Americans. Lower back pain is a right pain the neck, so to speak. Eighty percent of Americans experience it at some point in their lives, resulting in approximately $100 billion being sucked out of the economy because of lost work days every year. Still, we do pump at least half of that (yes, $50 billion - with a "b") right back into the system treating the condition, ensuring we have an endless supply of analgesics, non-steroidal anti-inflammatory drugs (NSAIDs), opioids, duragesic, biologic response modifiers such as Enbrel - which is partly responsible for keeping Phil Mickelson on the golf course, and whatever else works. Thankfully, 90 percent of those that suffer significant discomfort feel their symptoms recede or disappear altogether within two months of their onset, often without the need for any treatment at all. But an estimated 85 percent are never given a positive diagnosis explaining the cause of the pain, despite having a thorough medical examination. The remaining 15 percent can point to something specific, which is useful in knowing how to deal with it of course, but sometimes the pain is chronic and might not respond terribly well to treatment of any kind. Golfers know low back pain well, of course. Jack Nicklaus had severe problems as he approached his half-century but found something - the Egoscue Method - that alleviated the worst of them. Seve Ballesteros had a long history of back pain. And we all know Fred Couples's story. The 1992 Masters champion and 15-time PGA Tour winner would surely have compiled an even better record had he not endured considerable discomfort over the past 20 years. No matter the location, severity, and duration of the pain, it plays havoc with our golf games. If we can swing a club at all, it inevitably hurts and we are unable to reach the positions our coach has advised and capable of generating only a fraction of the clubhead speed we could if pain weren't an issue. I say "we" because I know how you feel. Osteoarthritis has been my problem for five years and, like you, I'm on a constant search to find something - anything - that enables me to play the greatest game more often. Probably the most common causes of back pain are muscle and ligament sprains - a sprain being an injury to a ligament which attaches bone to bone, a strain being an injury to a muscle or tendon which attaches muscle to bone. Strains occur when you injure a muscle involved in the movement of the spine, and are usually the result of heavy lifting or uncontrolled movements such as over-exuberant dancing. Strains are not accompanied by sciatic pain, although spasms are common and flexibility is hindered, resulting in decreased range of motion. Sprains are often the cause of over-stretching a ligament while twisting sharply. 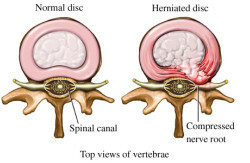 Another common problem is a herniated disc which often occurs after continuous vibratory motion such as driving a truck or using heavy machinery, although sudden falls can also be to blame. The jelly-like central part of a disc bulges out of its central cavity and compresses or "pinches" the nearby nerve. 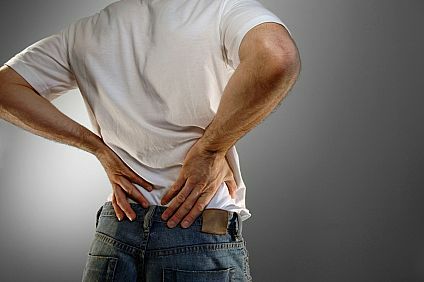 Unlike strains, herniated discs do cause sciatica - pain that travels down the buttocks and legs. Stenosis is relatively common in people aged 50 and over, and is pain associated with the narrowing of the spinal canal - openings in the vertebrae through which the spinal cord passes - and consequent impinging of the nerves. It is caused by injury, arthritis and aging and, as with herniated discs, is accompanied by sciatic pain along the back of the leg. The pain of osteoarthritis - or degenerative joint/disc disease - follows the loss or of the cartilage between vertebrae, which causes bones to rub together causing inflammation. Bone spurs, or osteophytes, are often formed along the damaged joint's surface area and can pinch nerves leaving the spine leading to pain in other parts of the body. Osteoporosis is a serious reduction in bone density increasing the likelihood of bone fractures or breaks. It has been discovered recently that Fibromyalgia patients - who suffer pain in their muscles and ligaments - have three times more Substance P in their cerebrospinal fluid than they should (Substance P is a neurotransmitter whose job it is to tell our brains we are feeling pain). Pain in the lumbar region of the spine can therefore be felt more intensely in Fibromyalgia than it is in other disorders, although that pain is often chronic, lasting much longer than the two or three weeks of acute pain. Spondylosis refers to degenerative osteoarthritis and occurs when discs lose moisture and volume with age. Myofascial Pain is not dissimilar to that caused by Fibromyalgia and affects muscles and/or fascia - the layers of fibrous tissue surrounding muscles. It is characterized by deep, constant, aching pain, and caused by compression of trigger points - described as hyper-irritable spots in skeletal muscles. 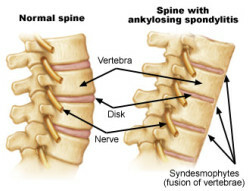 Ankylosing Spondylitis is a form of arthritis that tends to start around the sacroiliac joints, where the sacrum (the lowest major part of the spine) joins the ilium bone of the pelvis in the lower-back region. The pain and stiffness are constant and it is common for vertebrae to actually fuse together. Golfers also experience great discomfort from spinal tumors such as astrocytomas, ependymoma and other gliomas. Here is a list of treatments you might consider using to reduce back pain. Before trying anything, however, you must remember I am NOT a doctor and therefore in no position to instruct you on how best to treat your condition. Having tried most of the following, however, I can at least tell you what has worked for me. This is usually the first place people look for relief. Ideally, we're looking for a drug that blocks pain without causing significant side effects. I have used a powerful prescription analgesic that is an opioid for three years and, while it is no longer as effective as it used to be, it did give me 18 months to two years of relatively pain-free golf. Before being prescribed this drug, I used over-the-counter (OTC) non-steroidal anti-inflammatory drugs (NSAIDs) such as Ibuprofen, Aleve and Advil. But they stopped working for me long ago. Glocosamine is an amino sugar that many people use as a dietary supplement to prevent cartilage degeneration. Comments: Over-the-counter drugs now have zero effect, while the prescribed medication does at least allow me to play golf, though not terribly well. 10-15 minutes a day can make a big difference. It is well-known every golfer would benefit from a stretching routine and participating in some form of exercise, especially as he or she ages. And if they are capable of it, and have consulted with their doctor before starting, the golfer with back problems really should make it a regular part of their day. There's no question that, though it may not have addressed my arthritic pain specifically, regular stretching has helped me alleviate muscle stiffness and kept me as flexible as I can reasonably expect. The Internet is a great source of info for golfers seeking good stretching routines. I usually look for articles and advice from experts such as Susan Hill and Roger Fredericks, who has kept many a senior golfer playing competitively. Comments: Physical therapy doesn't have much effect on the site of the pain itself, but my stiffness is greatly reduced and flexibility maintained. There's nothing like a good massage . . . in theory. Thing is, massage has never really done it for me. I have never come out of a massage room looking and feeling as relaxed as I think I should. I like a massage of the scalp and shoulders certainly, but have long found back massages to be uncomfortable. Knowing the massage therapist will be focusing on the back, I think I subconsciously prevent myself from experiencing what is known as the "relaxation response," which in others allows the heart rate and blood pressure to drop, stress hormones to decrease and muscles to relax. Comments: Always felt that massage doesn't produce the same effect in me as it clearly does in others. It works for too many people for you not to even consider it. According to those who practice traditional Chinese medicine, stimulating acupuncture points in the skin with ultra-thin needles corrects imbalances in the flow of qi - or life force, thus preventing or even curing disease. A lot of people are put off by the needles, but they shouldn't allow that to prevent them from at least trying acupuncture - the needles are so thin, if you look away you won't even know it's been inserted. Though I know precious little about it, it seems there are different ways to practice the ancient art. While some acupuncturists have felt three or four needles - placed in seemingly random spots - was all that was needed, others have more or less covered my back with upwards of 30 needles positioned symmetrically. I've had a wide range of results. At best, I've had two to three weeks of reduced pain before the need for a return visit. But I've also left a couple of clinics feeling worse than I did before going in. The last acupuncturist I saw left me in the room to "relax" with 40-something needles in my back for what she said would be 30 minutes. After 90 minutes I went looking for her with the needles still in place. She had totally forgotten about me, and I left the building feeling rather strange. 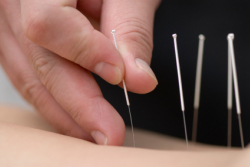 Acupuncture has its devotees for sure, but a very thorough report published by the Cochrane Collaboration in 2008 found it is perhaps less effective than massage for long-term back pain relief. Comments: A bit hit and miss. Don't give up if your first attempt goes badly. A committed search for a top-quality acupuncturist who really knows what he/she is doing could be time (and money) well spent. A rigid brace such as a Boston Overlap brace or Thoracolumbar Sacral Orthosis is form-fitting and can reduce movement in the spine by 50 percent, enabling fractures or broken bones to heal quicker. A corset, or elastic brace, also limits motion but is considerably more comfortable. Braces not only limit motion of the spine but act as a reminder to maintain proper posture, which reduces the negative effects of gravity on our ligaments, muscles and joints. Braces stabilize and support the lumbar sacral and abdominal regions to provide relief from lower back pain. My brace definitely reduces pain. I am still aware of the affected area in the lumbar region, but the brace does improve my posture, which has a very positive effect on the level of pain while walking and at address. Comments: My doctor warned me not to wear my elastic brace, okay corset, all the time but rather to exercise and work on my posture to the point where the brace is unnecessary. I will do as she says, of course, but the brace does feel good. Capsaicin is a purified extract of red chili peppers (capsicums), the substance that creates the spicy heat. It is effective in reducing Substance P but only after a period of several weeks. I purchased my first stick of Capsaicin a week ago so all I'm feeling at the moment is burning skin. Comments: It's too early to tell if my stick of Capsaicin is effective or not. At the moment I'm not enjoying the burning sensation much, but I shall give it a month. After you open the packet of a typical heat-wrap, the iron powder, salt, water and charcoal inside mix with the air to set off a chemical reaction that causes a good deal of heat. This heat when applied to the skin relaxes muscles and eases pain. They can also have a positive effect on arthritic pain as the heat will relax the muscles around the affected joint, reducing pressure. And heat dilates blood vessels, stimulating circulation and reducing muscle spasms. Conversely, cold wraps reduce swelling by constricting blood vessels. And they can numb deep pain. Comments: I've tried both and found that neither has a profound effect. The heat is a pleasant sensation, but the effect passes quickly once I remove the wrap. Unconventional, but many people swear by them. When held against the skin, magnets relax capillary walls, thereby boosting blood flow to the painful area. They also help prevent the muscle spasms that underlie many forms of pain - apparently by interfering with muscle contractions. And they interfere with the electrochemical reactions that take place within nerve cells, impeding their ability to transmit pain messages to the brain. Comments: Though well aware of the positive results many have experienced with magnets, I personally have had no such benefit. TENS is the use of electric current produced by a battery-operated device to stimulate the nerves. Non-invasive, it comes with very little risk and no side effects, and reduces pain by activating opioid receptors in the central nervous system, producing endorphins and blocking pain signals. The device is wired to pads that adhere to your skin and transmit the electrical pulse. The user can determine the strength and frequency of the pulses. It feels like a cluster of tiny pin pricks, similar to pins and needles. Turn it up too high and the sensation is very unpleasant. At the right level, it can work like a charm. Comments: You need to find a combination of strength and frequency that you feel comfortable with but which still has the desired effect. Most TENS units are small enough to attach to your belt, which means you can have it on while playing golf - just tuck the wire somewhere so it doesn't dangle at your side. Comments: I have avoided chiropractic in the past because I always assumed, wrongly perhaps, arthritic pain was not on the list of conditions chiropractors were able to treat. A quick Google search, however, makes it clear chiropractic does indeed claim to treat arthritis. The Vacupractor is very easy to use. 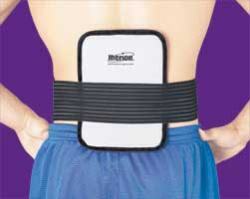 "The VacuPractor's straightening pressure is applied while the user is in a comfortable supine position. The force it applies is a vacuum that is created by movements the user makes while lying on the device. By pulling outward with a user controllable vacuum the muscles in the low back are also stretched in three dimensions, stretching the muscles while the user is not using them. The vacuum also increases the diameter of the blood vessels in the area which increases blood flow which is the active mechanism of aspirin and other pain relieving medications." (Russell Notestine - Vacupractor inventor). Comments: It didn't really have much effect for me, which was disappointing because I've heard half-a-dozen genuine success stories from golfers in the Seattle area where the Vacupractor is made. I think I didn't give it long enough to work perhaps, although the product details do say relief can be felt almost instantly. I returned mine and was refunded my money immediately, which proves the company really does believe in its product. 5,000 years after the first yoga instructor rolled out his/her mat and performed a series of breathing and stretching exercises to background whale music, the ancient Hindu spiritual and ascetic discipline is still going strong. Modern practitioners have removed the religious and spiritual elements, resulting in a widely-accepted form of exercise and relaxation that can decrease stress, build muscle tone and strength, reduce pain and stiffness, and increase range of motion. Yoga stretches all of the body's soft tissues including ligaments, tendons, and the fascia sheath that surrounds muscles. It can improve posture and breathing and positive results can be realized quickly. Comments: Numerous reports have been published recommending the use of yoga. Even the National Institutes of Health (NIH) in Bethesda, Md. celebrates an annual Yoga Week when staff members can be seen on the lawns balancing on one leg or reaching for the sky. I have always found it good for reducing stress and taking my mind off pain. The problem comes when you finish your routine and immediately start thinking about pain again. Couples is getting good results with Regenokine. Blood is extracted then heated slightly, inducing the inflammation that is a normal healing mechanism for the body. The blood is then spun in a centrifuge and separated into its constituent parts. Red blood cells collect at the bottom of the tube, while a yellowish layer forms above it. The yellowish serum contains concentrated cytokines that fight inflammation and proteins that promote good health and block pain. After being injected back into the patient, the serum can bring immediate pain relief to most patients. In others it can take several weeks. The feel good effects are effective in about 75 percent of patients and typically last two to four years. Likely to try: Er, probably not. Comments: Regenokine does, of course, sound remarkably similar to the procedure - Platelet-Rich Plasma Therapy - that Dr. Anthony Galea was performing on Tiger Woods at his home in Orlando. But Regenokine, or Orthokine, differs by targeting interleukin, proteins or molecules that cause inflammatory responses. It is unproven in extensive medical tests and not yet approved by the FDA meaning, for now, you have to go to Germany. Developed by Ida Pauline Rolf in the 1930s to help the chronically disabled, Rolfing is basically a painful, deep-tissue massage that focuses on the stimulation of the connective tissues and is said to be most effective in chronic pain associated with Achilles tendonitis, cervical pain, osteoarthritis, rheumatoid arthritis and Reflex Sympathy Dystrophy. Comments: Not keen on painful, deep-tissue manipulation. Though not a painkiller, cortisone is a powerful anti-inflammatory medication that can be administered in high concentrations to the affected area. Doctors tend not to give patients more than three injections in any one site over the course of a year as side effects can be serious. There is evidence to suggest repeated use can lead to deterioration of cartilage, which will add to your pain once the medicine's effects wear off. Likely to try: Probably not. Comments: It seems that while there are genuine short-term gains, i.e. less pain, there will be long-term losses. The pain will return and could well be worse than it was before the injection. Never say never, but I will need a very good reason to have a cortisone injection - like an unexpected invitation to play in the Masters. According to spine-health.com, the only effective surgical treatment for spinal arthritis is spine-fusion surgery to stop the motion at the painful joint. However, spine-fusion surgery is generally not recommended since the arthritic condition tends to affect multiple vertebral levels in the spine and multi-level fusions are "generally not advisable." The spine is designed to move, and the loss of motion can cause additional pain. The Mayo Clinic, meanwhile, says that "most back problems can be taken care of with non-surgical treatments, such as anti-inflammatory medication, ice, heat, gentle massage and physical therapy. When conservative treatments don't help, back surgery may offer relief, but it doesn't help every type of back pain." Comments: I've heard too many negative stories involving patients whose pain level and range of motion were no better post-surgery. Again, never say never, but for me surgery is the very last resort. Stack & Tilt could help. While medication, physical therapy and all the other methods and procedures listed above may do a good job of reducing pain and stiffness and maintaining good range of motion, it's unlikely any of them are going to make the problem disappear entirely. So you're probably going to have to alter your swing in order to play comfortably and maintain a decent level of performance. With back pain, you will inevitably lose club-head speed, so it's worth incorporating a few moves that will help you maintain - or even increase - it without much effort on your part. Start by opening your left foot out at address, maybe as much as 45 degrees, which makes it easier to rotate the hips quickly through impact. Be sure to hold the club lightly in the fingers, and work on hinging the wrists a little more in the backswing. Also, it may be worth considering a move to the Stack & Tilt swing. There are two very extreme, not to say vociferous, schools of thought about Stack & Tilt as it relates to back pain. 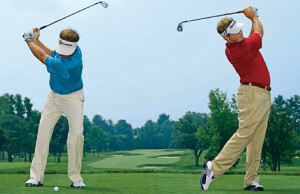 Some argue that keeping your weight on your left side throughout the swing, as Stack & Tilt instructors Andy Plummer and Mike Bennett advocate, increases pressure on the spine, decreases "segmental velocity," and is an unnatural sequence of moves that work against the body's design. Others, and Bennett especially, maintain that because the swing is so much more stable, with fewer moving parts, the body's center of gravity remains constant, which not only results in more consistent golf but also reduces the potential for injury. Perform a Google search for "Stack & Tilt back pain" and you'll find forums galore with golfers weighing in on the subject. Roughly half say their lower back has suffered, the other half say it has proved very beneficial. Most people with back pain find the pain intensifies at impact. Hitting irons is considerably more uncomfortable than hitting a driver because with irons you are hitting down into the ground slightly, rather than swinging up on the ball and avoiding contact with the ground. As your pain worsens and your swing gets shorter and slower, you may find it helpful to swap steel shafts for graphite, and blade irons for a full set of hybrids such as the Adams a70S, or super game-improvement irons like the Callaway Diablo Edge. 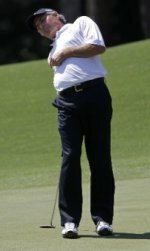 This article first appeared on cybergolf.com.